Shrimp are an excellent source of selenium and unusually low-fat, low-calorie protein. 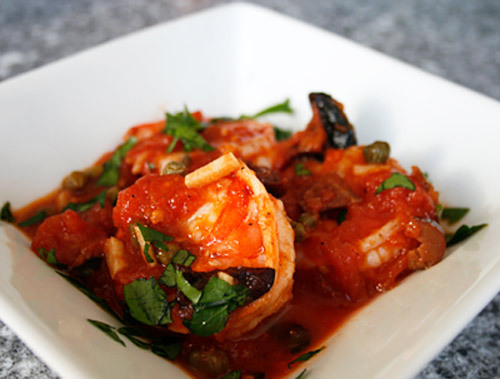 Quick cooked shrimp in a zesty tomato sauce makes a healthy and tasty appetizer. Heat the oil in a frying pan over medium heat, and when hot, add the garlic and shrimp. Remove the shrimp from the pan, and add the wine. Turn the heat up to medium high and cook until it has almost evaporated. Add the tomatoes, and cook until the sauce thickens, about 10 minutes.